Homemade pretzels. Photo by Donna Turner Ruhlman. Half my demo was on baking and making a 5:3 bread dough into several products, and I also wanted to bake gougères, cheese puffs, so I went early to make sure the ovens were cranked. I was assured by the very efficient woman running that stage that it was. Thirty seconds into the demo, I went to put a loaf that had risen into the oven, and realized it was stone cold. It went downhill from there. Bread that didn’t bake, fritters that didn’t cook through, pâte à choux flying all over the place. A real mess. Even the pretzels, baked backstage, came out albino. For example, to those who have embraced ratios, I can simply say, to make pretzels, mix a 5:3 bread dough, shape pretzels, brush with a lye solution, add salt, bake, and you’re good to go. The following recipe will make about 10 pretzels. Mix the flour, water, yeast, and salt until you have a smooth elastic dough. Cover it and let it rise to about double its volume, 2 to 4 hours depending on how much yeast you’ve used. Beat it down manfully to release the gas and redistribute the yeast. Divide the dough into roughly 3-ounce portions. Preheat your oven to 425°F/218°C. Roll the portions into cylinders about 10 inches long. Cover them with a towel while you prepare the lye and ready your nonreactive baking sheets (it’s best to use a nonreactive surface; don’t use aluminum, as the lye can do funny things to it). Heat the lye solution in a pan that will allow you do dip your pretzels and retrieve them with a wide, slotted spatula. Coat your baking surfaces with vegetable oil. When the lye solution is hot, just below a simmer, dip each pretzel in the lye solution for 10 or 15 seconds, then remove to your baking pan. Repeat with the others, sprinkle them with salt, and bake for 12 to 15 minutes. There’s no end to the fun when you know the basic bread dough ratio! 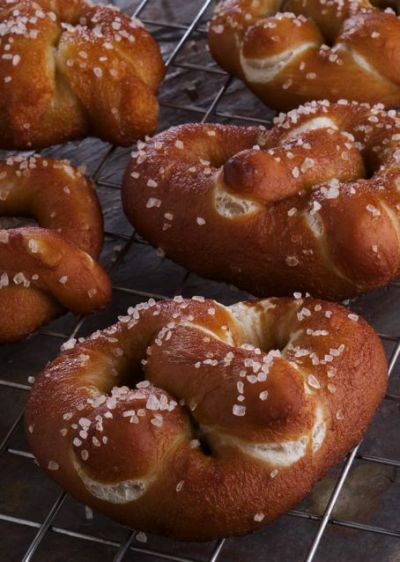 Update 10/9/2012: The Bouchon Bakery Cookbook comes out two weeks from today; there is, happily, a recipe for pretzels from head baker Matt McDonald, one of the greatest bakers I’ve had the opportunity to work with. He uses a levain (a pre-ferment for flavor) and a very slack dough. Matt told me that the manufacturer recommends a 4% lye solution; he uses a 4.2% solution. He uses room-temperature water (just be sure the lye is dissolved), and gives the pretzles 20 seconds in the bath. My post on how to make homemade brioche. 20 recipes from Serious Eats that can help you celebrate Oktoberfest. The human is a pretzel in many ways, especially when it is time to dance. Learn about the history of mustard from the Nibble. Where do you get food grade lye? I only used a few tablespoons for the olives and I needed another recipe for all that lye, just in time for beer season. Must make some mustard to compliment these beauties, Thank you! Carole: try http://www.essentialdepot.com They currently have 2lbs of food grade lye on sale for 3.44 (probably $10 after shipping). This will last a very long time for pretzel making. Make sure you choose food grade and not tech grade which is theoretically even more pure but also more expensive. I believe Michael used drain cleaner from home depot when he did the olives (not joking, if I remember correctly). Given how cheap essential depot is, I don’t recommend that though a lot of people have done it and lived to tell the tale. I use 1/2 cup baking soda to 2 quarts of water. I bring the water to a hard rolling boil, add the soda (be careful, it WILL foam up but shouldn’t overflow if you use a wide pot), and drop my dough for 15 seconds per side. Also, for those who don’t know, one type of food-grade lye is “pickling lime”. I use that for making hominy (which I then dry and grind for grits). this is what someone on facebook also recommended as replacement for lye. Pickling lime is calcium hydroxide, lye is sodium hydroxide. Wear latex gloves, long sleeves and safety goggles and always be sure to add lye to water, never the other way around, and take care not to splash. Also, baking soda will not result in a Bavarian style pretzel crust or flavor. You really need to use lye. Of course you then need to deal with disposal of the lye water. lye water not good for cleaning pipes? Not when on a septic system. I’m guessing a third to a half cup of baking soda to a gallon and a half of water, considering how the proportions work for bagels. I tried finding Lye in the area and apparently, lye is a key ingredient for making Meth. So out here in Oregon you can’t find lye at hardware stores or food supply shops.So I also used htpp://www.essentialdepot.com to purchase my lye. They are very nice people, not at all “Meth like”. A 2 lb order makes a lot of pretzels; we are now looking into making our own soap. Baking soda won’t get you close at all, you can however heat it in the oven using the Solvay process to convert is into sodium carbonate which will get you somewhat closer to the pH of lye, ~11.6 vs 8.4 and since the scale is logarithmic that’s a pretty decent jump. An hour or so at 400F will release carbon dioxide and water, store in an air tight container. Driving off the water is of no use when you are just going to turn around and add it to water. And the heat of boiling (thermal decomposition) releases the CO2. Baking soda works just fine at a ratio of 1/2 cup to 2 quarts of water. I make this a couple times each week. I guess my pH meter must be broken then. Peter Reinhart says, for safety, you can use a baking soda dipping solution: 8 tsp (57g) baking soda, 2 cups (454g) warm water, and an optional egg white for sheen. I haven’t tried it, but I’m not crazy about working with lye. I’d do it with my kids, not concerned, just need to be careful. Gloves are required if dipping by hand. I wonder if that was Peter Reinhart or his publisher’s lawyer talking. On the Good Eats episode that dealt with pretzels Alton more or less said that lye is way better but he was showing the baking soda method for legal reasons. There is a difference between a pretzel and a pretzel shaped bagel (which isn’t to say one is objectively better than the other). Forgot to mention why I’m not crazy about making bagels with lye. Jeffrey Hamelman’s wonderful “Bread” book describes how to make bagels with lye. He says to wear plastic gloves that go well up the forearm and have eye protection. His technique is not for the home baker. Wire screen with two handles and a second wire screen without handles that fits on top of first to keep bagels from floating. Stainless steel tank large enough to hold the screens and deep enough to completely submerge the bagels. He dips chilled bagels for five seconds in the lye solution. Lye is easy and safe with a few precautions. You can’t beat the effectiveness of removing the bitterness in unripe olives. Keep vinegar near by, it will neutralize the lye if you happen to spill some. Mix outdoors, or well ventilated, and not during happy hour. I’m not beyond that last idiotic step. is the instant yeast active or instant? Saw this post, made the pretzels, LOVED the pretzels! Thanks! Just saw this post by Hank Shaw on lye-cured olives http://honest-food.net/2012/10/15/curing-olives-lye-recipe/ (Michael I just spotted your 2009 post on the same subject). Hank’s research leads him to believe that there is no difference between food-grade lye and 100 percent sodium hydroxide drain cleaner. i make homemade pretzels at least once a week using baking soda with perfect results. i used to measure it out at 1 tbsp per cup of water, but now i just use a bunch of baking soda in enough water to cover my pretzels. last night, i made garlic pretzel rolls (1 cup of flour yielded two large rolls that we happily slathered with the best vermont butter i’ve ever had). we promptly made two more.